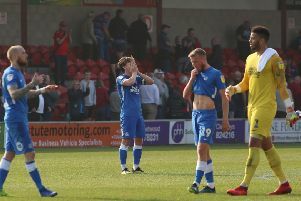 Peterborough United boss Steve Evans blamed a two day break for his side's disappointing display against Doncaster Rovers. Posh were second best for much of the match, but Ryan Tafazolli's second-half header cancelled out John Marquis' first-half opener for the visitors. The result ended Posh's five match winning streak at the start of the season but they remain at the top of League One. Evans, who was sent to the stand during the game, admitted after the match that he knew within 10 minutes of the match that he had a mistake not changing his side for the first time this season. He said: "It was frustrating. I have to take some blame as the manager as I gave them a couple of days off at the start of the week because they had been off all over the country. I've always learnt with experience over the years that you don't give them two days off when you're on that type of run so I'll take the blame, because when the boys came in they looked sloppy, they looked off it. "We tried to address it as a team because they knew that, and it never really got much better towards the end of the week. And I think for 50 minutes we played like that collectively. There were no individuals that gave us a spark. "We changed the system at half-time and how we were going to play and that changed it - we dominated the game for 35-40 minutes, got the goal. We were perhaps unfortunate not to get a second. "And then later in the day we were having to take a point. People looked as if they were out of energy which has not been like us, but I'll take the responsibility of the two days and it won't happen again. "Isn't it great that we're really, really down tonight and we're top of the league. I don't think that ever happened here before, even in Barry's (Fry) time." Evans also said the match was "a bit of a cup final" for Doncaster due to the return of Grant McCann, who had managed Posh before Evans and also had a glittering playing career at the club. But he praised the impact of second-half substitute of Ivan Toney who improved Posh when he came on. He added: "I think I could have probably given (Andy) Butler and a couple of players in their back four a bit of a problem because Matty (Godden) and Jason (Cummings) were not having the best of days. It was a frustrating day for them. "I'm not questioning how hard they work or their desire.because this group has that in abundance, but we were not on the front foot today, we did not have that spring in our step, and when you don't you pay a price. "Ivan has been outstanding in training and he's come on, and now you have three players competing for two positions."